Why use this coloring book? The Fourth Edition features user-friendly two-page spreads with enlarged art, clearer, more concise text descriptions, and new boldface headings that make this classic coloring book accessible to a wider range of learners. Wynn Kapit, the designer and illustrator of this book, has had careers in law, graphic and advertising design, painting, and teaching. In 1955, he graduated from law school, with honors, from the University of Miami and was admitted to the Florida Bar. He practiced law both before and after military service, Four years later, he decided to pursue a childhood ambition and enrolled at what is now the Art Center College in Los Angeles, where he studied graphic design. Afterwards, he worked in the New York advertising world for six years as a designer and art director. He “dropped out” in the late 60s, returned to California, and began painting. His numerous exhibitions included a one-man show at the California Palace of the Legion of Honor in 1968. He returned to school and received a Masters in painting from the University of California, Berkeley in 1972. Kapit was teaching figure drawing in Adult Ed in San Francisco in 1975 when he decided he needed to learn more about bones and muscles. He enrolled in Dr. Elson’s anatomy class at San Francisco City College. While he was a student, he created the word and illustration coloring format that seemed to be a remarkably effective way of learning the subject. He showed some layouts to Dr. Elson and indicated his intention to do a coloring book on bones and muscles for artists. Immediately recognizing the potential of this method, Dr. Elson encouraged Kapit to do a “complete” coloring book on anatomy and offered to collaborate on the project. 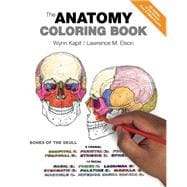 The first edition of The Anatomy Coloring Book was published in 1977, and its immediate success inspired the development of a completely new field of publishing: educational coloring books. Kapit went on to create The Physiology Coloring Book with the assistance of two professors who were teaching at Berkeley: Dr. Robert A. Macey and Dr. Esmail Meisami. That book was published in 1987 and has gone through two editions. In the early 90s, Kapit wrote and designed The Geography Coloring Book, now in its second edition. Lawrence M. Elson, Ph.D., planned the content and organization, provided sketches, and wrote the text for the book. This is his seventh text, having authored It’s Your Body and The Zoology Coloring Book and co-authored The Human Brain Coloring Book and The Microbiology Coloring Book. He received his B.A. in zoology and pre-med at the University of California, Berkeley and continued there to receive his Ph.D. in human anatomy. Dr. Elson was assistant professor at anatomy at Baylor College of Medicine in Houston, participated in the development of the Physician’s Assistant Program, lectured and taught dissection and anatomy at the University of California Medical School in San Francisco, and taught general anatomy at the City College of San Francisco. In his younger days, Dr. Elson trained to become a naval aviator and went on to fly dive-bombers off aircraft carriers in the Western Pacific. While attending college and graduate school, he remained in the Naval Air Reserve and flew antisubmarine patrol planes and helicopters. His last position in his 20-year Navy career was as commanding officer of a reserve antisubmarine helicopter squadron. Dr. Elson is a consultant to insurance companies and personal injury and medical malpractice attorneys on causation of injury issues, a practice that has taken him throughout the United States and Canada. He has testified in hundreds of personal injury trials and arbitrations. His research interests are focused on the anatomical bases of pain following low velocity motor vehicle collisions. Currently, Dr. Elson is an active writer, and has just completed a book on a distillation of ten years of far-ranging conversations between a judge and himself; the book is called My Dear Boy.